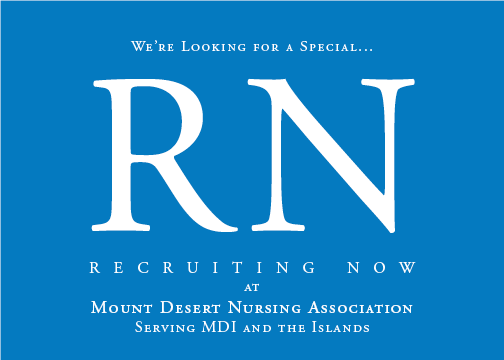 At Mount Desert Nursing Association, RN not only means Registered Nurse, it means: Reassuring Neighbors, caring for our Island Community and keeping MDI and the surrounding Islands “Healthy at Home”. 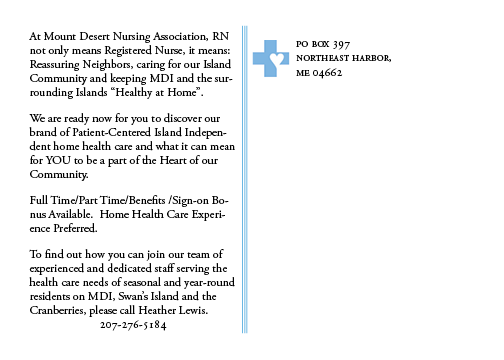 We are ready now for you to discover our brand of Patient-Centered Island Independent home health care and what it can mean for YOU to be a part of the Heart of our Community. Full Time/Part Time/Benefits /Sign-on Bonus Available. Home Health Care Experience Preferred.